The UV collar and borehole, showing the water of Subglacial Lake Mercer, from the SASA Project. Photo: Billy Collins, SALSA Science Team. Why it matters: It's only the second subglacial lake in Antarctica to be explored, in an area as vast as twice the area of the continental U.S. That means scientists have to draw a lot of conclusions from drilling two holes — but it's the only way to learn about what kind of life exists in the mysterious world of subglacial lakes and rivers deep beneath the ice. In addition, researchers think that the water moving underneath the ice sheet could further destabilize portions of the Antarctic ice sheet, adding to the already quickening pace of sea level rise. The big picture: Until a little more than a decade ago, we didn't know that subglacial lakes existed in Antarctica. Scientists discovered them largely by accident, while studying the ice sheet using satellite-based instruments. 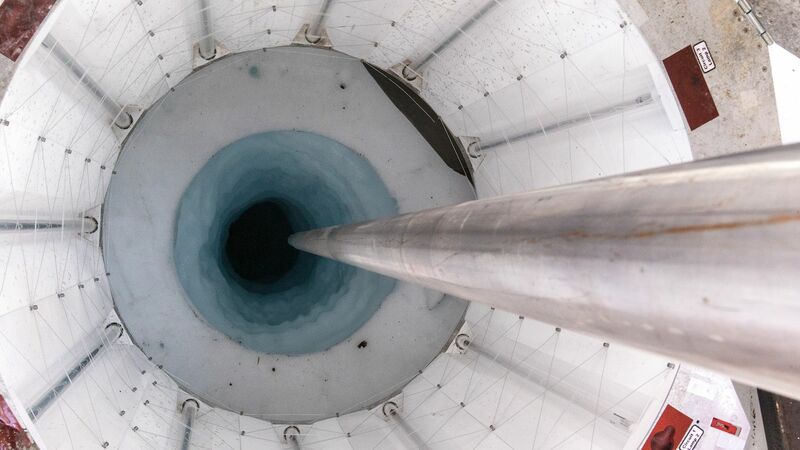 Researchers sampled the first, Subglacial Lake Whillans, in 2013, finding abundant microbial life. Now we have much more data collected from a second subglacial lake, known as Subglacial Lake Mercer. During the past 2 months, a large team of researchers drilled deep beneath the ice pack, about 1,100 meters, or about 3,600 feet, where they broke through to confirm the presence of microbial life in Subglacial Lake Mercer. They collected water samples, and drilled the longest-ever sediment cores gathered from beneath a subglacial lake, at 3 feet and 5.5 feet long, respectively. These cores should tell scientists more about the history of this region, and how the nutrients buried in the sediments are feeding microbial life, which are living in an environment that is devoid of sunlight. Fricker discovered Subglacial Lake Mercer by accident in 2007, while using satellite measurements to search for the grounding line of a glacier. She serves on the SALSA executive committee. “The picture that's been developing over the past decade or so is that there is this big hydrological network" underneath the ice, said Mark Skidmore, a professor of Earth sciences at Montana State University told Axios in an interview from McMurdo Station in Antarctica. These lakes fill and drain periodically to the coast, providing material and nutrients to the coastal environment along the Ross Ice Shelf, Skidmore said. Between the lines: The SALSA project provides lessons for pursuing research in other extreme environments, such as other worlds in our solar system. Drilling under the ice in Antarctica is about as close as scientists will get to the challenges involved in drilling into a liquid ocean underneath a frozen layer beyond Earth, such as Jupiter's moon Europa, Skidmore told Axios. Such oceans are viewed as one of the most plausible places to find life outside of Earth. “We’re learning about the types of technologies and processes and how you’d go about doing it, and learning about what you’d find in those types of environments,” Skidmore said. What's next: Researchers will analyze samples and other data from Subglacial Lake Mercer, Priscu said, while also looking for other subglacial systems to explore.